The May meeting was held at Harrod Park on the 19th. Due to the president, Don Doute, being late, it started at 6:30pm. Fifteen members were present. The next meeting will be on June 16 at Harrod Park @ 6:00pm. Anyone who hasn't paid their dues, please do so. Harry Foster had the water permits for Indian Lake, and handed them out. He must have been using it because I hear that he is down sick in bed. Colleen Bradley has already found a gold cross while she and Harry and her were hunting at Indian Lake. 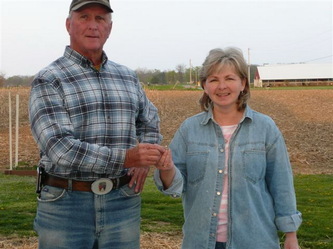 Denny Morrison has been collecting $20 from each member for the Ohio Metal Detecting magazine published by Nick Arnold. It is published quarterly, and very well written. For those who have not paid and receive the magazine, please pay at the June meeting. Dennis also has the early copies of this magazine for those who want them. Our club is always featured in this magazine along with many other clubs from Ohio. Nick also includes pictures of Ohio finds. There was a discussion about roll hunting. Also Denny showed an amazing video on his laptop of some of the fabulous finds in "Diggin' in Virginia". That was a great presentation. (Denny please give your site where the rest of the videos can be watched.) You can look at Denny’s You Tube video’s at http://www.youtube.com/user/ringfinder7 Please subscribe to this You Tube page. The 50/50 drawing was won by John Griffith - $20; Gary Rutledge - $10; and Don Doute - $6. Gold was selling last month at $1191.60; silver @ $18.17; and platinum @ $1598. Bill Dickerson found a Cracker Jack Mystery Club coin - the 17th President, Andrew Johnson. Between 1933 and 1936 Cracker Jack had their largest marketing campaign: "The Cracker Jack Mystery Club." Presidential coins were the prizes concealed in a separate cardboard section in each box. Each Cracker Jack box displayed a question mark. Approximately 32 million presidential coins were distributed by The Cracker Jack Company. You may go to this site for more information on the coin. I’m sorry, but I could not find a good picture of the Andrew Johnson coin and Lila wasn’t sure how to send a picture to me. Lila researched the item and they were introduced in May of 1933 and discontinued in May of 1934. Also Bill Dickerson found another ring in the parking lot of the K of C on June 4. There was a name in it so he should be able to find the owner. Also a 1945 mercury dime, a 1964 silver dime, and several wheaties. Lila found a 1918 mercury dime, a Tootsie toy car, a real nice cap gun that works but the trigger guard is gone, and a Kit Carson gun that I dug up last week at the neighbor's house, but it was in 5 pieces Super Glue Time, So sad. 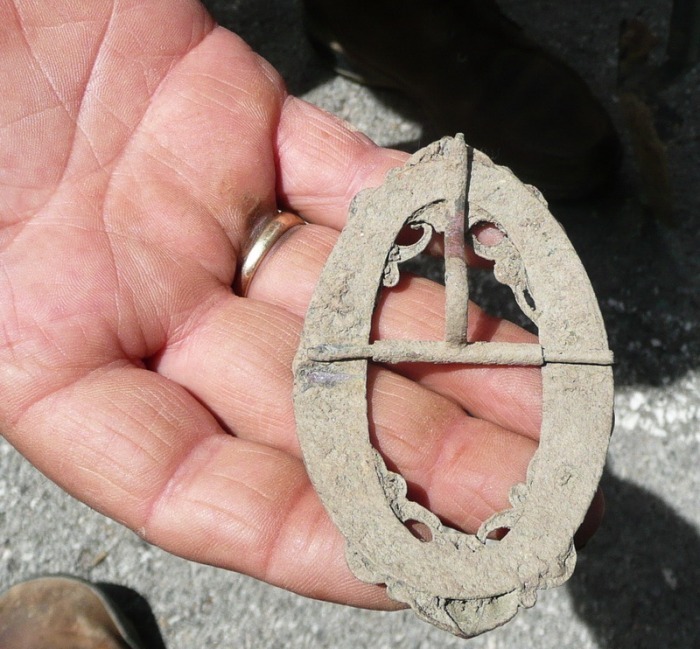 Harry Foster found a nice old brooch, and the 1-ring he found has diamonds in it. Way to go Harry. Roosevelt dimes, a War Nickel and a few wheat pennies. He also managed to find a couple of Indian Head pennies and a smashed Sterling Silver Ring. He also found a really neat ladies buckle. 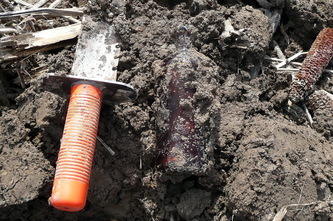 Denny Morrison found a 1943 War nickel and a small Silver Saint Christopher. 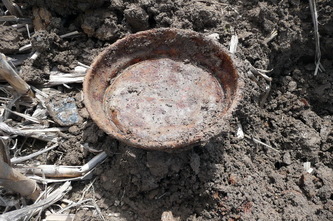 Also while detecting in a corn field he got a signal and it turned out to be a deep metal pan. In the same hole he found a nice cork bottle. If anybody wants to check their rings, Bill Dickerson will be bringing his diamond checker to the June meeting, so bring those rings in guys and gals. Congratulations to Gene Wolfe for receiving the Pride of Lima award. Mr. & Mrs. Robert Winkle celebrated their 60th wedding anniversary this month. A Big Congratulations to the Winkles. Bob and his Wife live near Kalida and Bob is one of our members. Bob also sells many brands of metal detectors at his home. Be sure to visit our club’s Web page located at http://www.ohiometaldetecting.com A big thanks to Nick Arnold for making this page for our club. Here is a Great site for learning how to clean your finds! If you’re interested, members of the club meet this Monday June 14, 2010 for breakfast and a Bull S_it session at The Lickity Split on State Route 65 ,1600 North West Street near North Land, at 8:30 A.M.
Click on any photo to view larger. Lila Dickerson sent me a very interesting picture of a one Room school house being moved. I will include the picture. Here is the article she wrote. 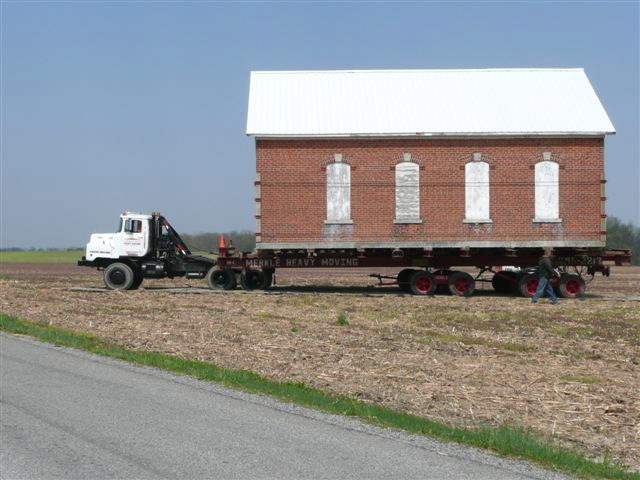 Merkle Moving Co. moved this school, weighing 132 tons, about a month ago in Shelby. Wayne Quellhorst's cousin, Bill Elsass, bought it and having it moved cost $30,000, and he has hired someone to restore it which will cost $70,000. It will take approximately 3 years to do. Now this is history!!! Lila also sent me a picture of Bill Dickerson returning a ring that he had found for a lady, here is the story she sent with the picture. On April 22 Bill received a phone call from Bryan Miller, asking if he would look for a wedding ring a friend of his had lost. He said she had been working in her garden. She actually had planted grass and had put straw over it. She had put her wedding rings in her shirt pocket, and forgot to leave them in the house. When she was done, the ring was missing. It had an emerald in the middle surrounded by diamonds, her choice of a wedding ring. It was around 7pm, and Bryan asked if we would come right out, which we did. We then followed Bryan to Lana Laury's house, and she said it might be in the straw or it might be down the lane with some dirt they had moved. We started looking and within 8 minutes Bill had found the ring in the straw. She was very happy, and then her husband came home and he was extremely happy also. Here is a Safety note, Don’t ever think it can’t happen to you!!! I was returning home from a day of metal detecting when I pulled into my driveway and saw my wife walking around the house. I asked her what she was doing and she said the FIRE alarm kept going off, but she couldn’t see any fire or smoke. I climbed up into our attic and it was so hot up there that it took my breath away, I couldn’t even touch the rafters. I called 911 right away, thinking I had a hot spot in the attic. 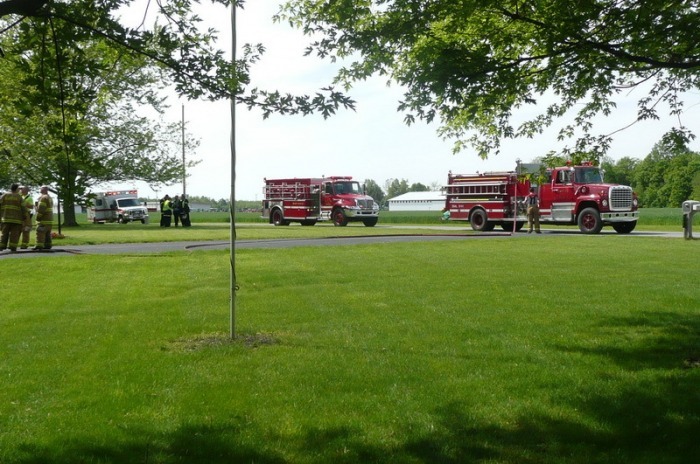 The Bluffton Fire and Rescue responded. They went into the attic and found that my Power Roof vents had failed and that is what was causing my File Alarm to go off. They estimated the heat in the attic to be well over 100 degrees. I now have new attic fans installed in the attic. 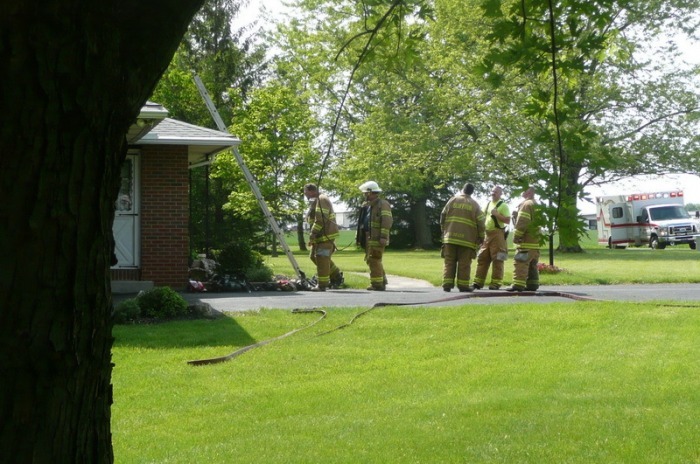 Just to be on the safe side, check your attic, make sure it is well ventilated. The man who installed our new electric vans said that they usually don’t last over 3 years. So I’m just sending this little safety note your way. Be Safe, Not sorry.